Coating thickness gauge for electroplating and electroless coatings XDV-Âµ or X-Ray Fluorescence Tester is available in various technical specifications. These are widely used for non-destructive analyses and measurements of coating thickness on very small components and structures, even with complex coating systems. 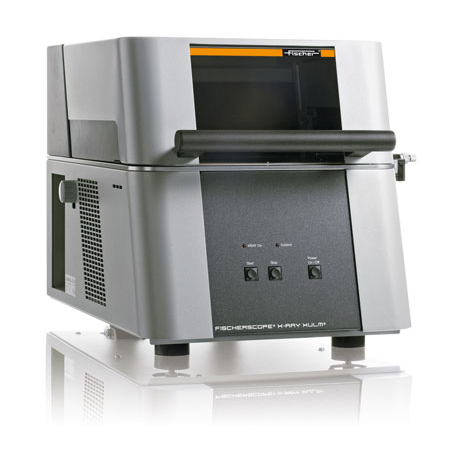 Intended use:Energy dispersive x-ray fluorescence measuring instrument (EDXRF) to measure thin coatings and coating systems on very small flat structures. Element range:Aluminum Al (13) to Uranium U (92) â up to 24 elements simultaneously. Design:Bench-top unit with hood opening upwards and housing with a slot on the side. For halo-free capillaries, the radiation intensity for all energies of the x-radiation is concentrated on the nominal measurement spot. For capillaries,indicated as non halofree,radiation intensity with high energies (E > 20 keV) can cover a significantly larger area than the nominal measurement spot. Distance compensation with patented DCM method for simplified measurements at varying distances. For particular applications or for higher demands on accuracy an additional calibration might be necessary. unidirectional: â¤ 5 Î¼m (0.2 mils) max., â¤ 2 Î¼m (0.08 mils) typ. Approval:Fully protected instrument with type approval according to the German regulations.